Recent studies have shown that an organised and clean workspace actually contributes greatly to the productivity of the people who are employed there. An office free of clutter and junk is also much more appealing to both current and potential clients of the business in question. So if you are wondering how to make your company’s base of operation better for your employees as well as the people hiring you for your services, the answer is pretty easy. Just make sure that the place is free of unnecessary items, clutter and junk. Naturally, you cannot slack off when it comes to cleaning your workplace. The ideal office cleaner will come after or just before opening hours and do their job without disturbing the work process, the people employed by you or coming to visit you at your workplace. 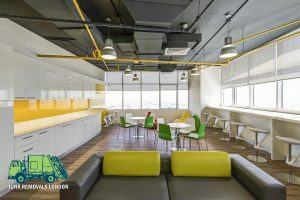 If you are not content with the way your offices are kept, you should not hesitate for even a second to find a new office cleaning assistance. No room for junk – from back issues of magazines in the waiting room too faded to be enjoyed by your clients to outdated furniture and equipment that is only gathering dust – you should get rid of all excessive items that you are no longer using. This will help your employees navigate faster through your place of work and do their job better. If you are not sure how to dispose of old equipment, do not hesitate to call a local contractor who offers all-around office clearance in London– the people they send will know what to do. Improve your office’s curb appeal – if there is an outdoor space attached to the building that has been neglected, or the hallway leading to your place of work’s door is dingy and unwelcoming, think about what you can do. The first impression your potential clients get is very important, and it begins even before they enter your office. As you can see those are just simple things that you can change in order to maximize the efficiency of your business, which will increase the amount of work thrown your way and subsequently your profits. You might be doing some of those already, but is it really worth it postponing turning your office in the ultimate work environment? One that you will look forward to getting back to the next day, which will stimulate you to do better and achieve more? Think about it.